This 4×5.65 carbon fiber matte box features a swing-away design for easy lens changes. There are two filter stages to allow for multiple filters to be used at once, one of which is 360-degree rotatable. 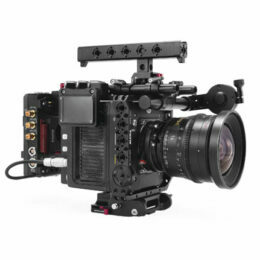 15mm LWS and 19mm rod attachments are included to allow you to customize the matte box to your desired rod system. Also included in the package are several hard mattes that provide flare coverage for all focal lengths between 16mm and 180mm. When coupled with the three French flags that are also included, there is an almost infinite amount of flare coverage.